Dangerous levels of hydrogen sulfide (H2S) gas released from gypsum-bedding-laden dairy manure storages have imposed risks to animal and human health, as demonstrated both on-farm and in bench scale studies (Fabian-Wheeler et al., 2017; Hile, 2016). Gypsum bedding is popular with some producers for advantages to cow comfort and health along with agronomic benefits. 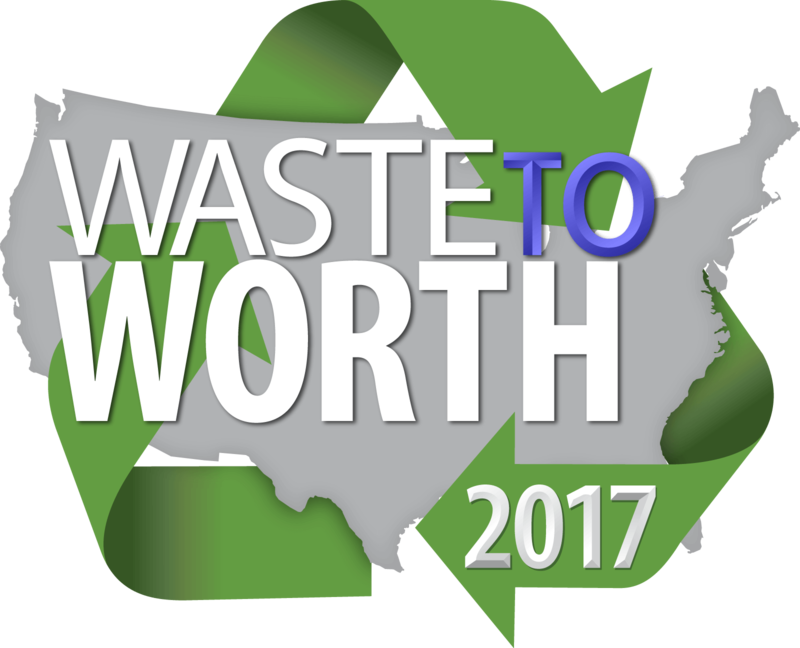 This project demonstrated the effect of iron oxide (FeO2) as a promising additive to dairy manure storages on mitigating H2S releases and odor. Two bench-scale trials comprised three replicates each (15 kg manure each vessel) of three treatments: (1) control (dairy manure only), (2) manure with gypsum added 0.35% by weight, and (3) manure with gypsum and iron oxide added at a 1:1 molar ratio with gypsum. 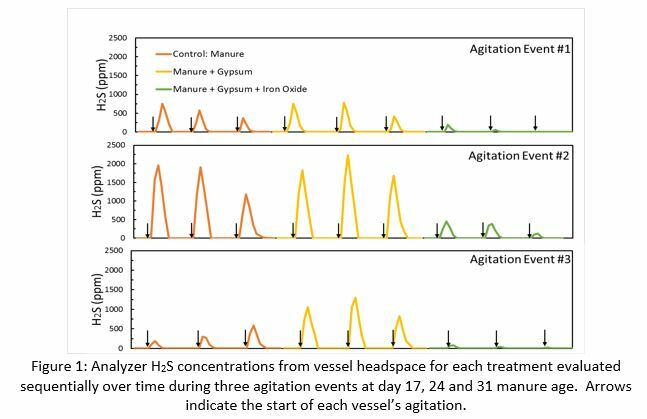 Headspace gas concentrations were measured using a Fourier transform infrared analyzer (FTIR model 700, California Analytical, Inc., Orange, CA) from each experimental vessel prior to and during manure agitation. Nutrient analyses were performed upon initial mixing and at the end of the incubations (PSU Agricultural Analytical Laboratory and Fairway Laboratories). Final incubation of the first trial included an odor evaluation of headspace gas according to international standard EN 13725 using qualified human assessors at the Penn State Odor Assessment Laboratory (abe.psu.edu/research/natural-resource-protection/odors). Odor quality testing on undiluted headspace gas used the labelled magnitude scale (LMS), Odor Intensity Referencing Scale (OIRS) and Hedonic Tone (pleasantness). High total sulfur in gypsum-laden manure confirms that gypsum provides the sulfur source that is converted to H2S. However, introduction of iron oxide maintained 98.8% total sulfur of manure sample by the end of incubation. The H2S concentrations remain low (below 5 ppm) in static conditions until gases are immediately released as soon as manure is agitated. Maximum H2S concentrations were reduced 83% to 96% in gypsum-laden manure by adding iron oxide (Figure 1). Despite anecdotal field reports of increased malodor associated with gypsum bedded manure, odor detection threshold (DT) did not increase with addition of gypsum compared to the control (manure only). However a 1:1 molar ration of iron oxide reduced the DT by approximately 50%. Odor quality results show that gypsum-laden manure created a less pleasant odor when compared to control manure. Field-scale research would strengthen these findings and document management and economics associated with the iron oxide treatment use on farm. Additional odor surveys would confirm odor intensity reduction via iron oxide. Fabian-Wheeler, E., M. L. Hile, D. J. Murphy, D. E. Hill, R. Meinen, R. C. Brandt, H. A. Elliott, D. Hofstetter. 2017. Operator Exposure to Hydrogen Sulfide from Dairy Manure Storages Containing Gypsum Bedding. Journal Agricultural Safety and Health 23(1): 9-22. Hile. M. L. 2016. Hydrogen sulfide production in manure storages on Pennsylvania dairy farms using gypsum bedding. Ph.D. dissertation. University Park, PA.: The Pennsylvania State University, Department of Agricultural and Biological Engineering.